Today we head into the "and beyond" category. 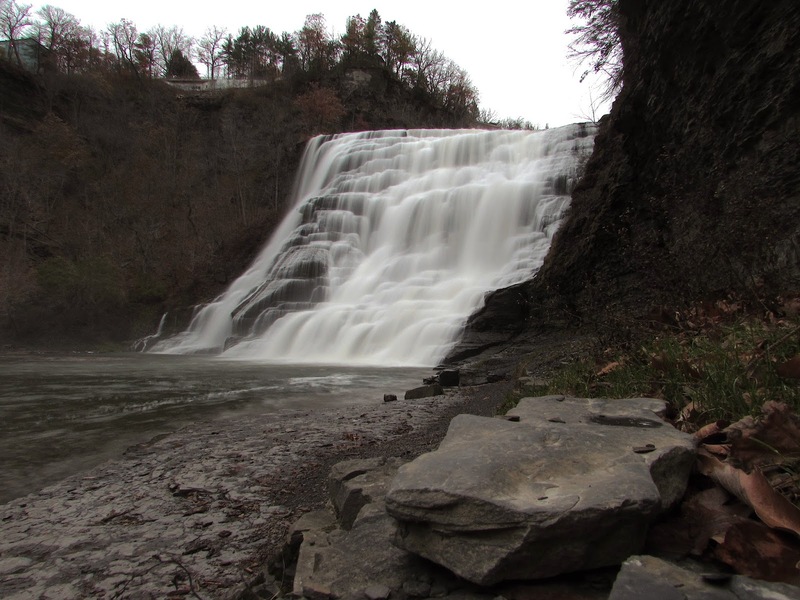 As you may have heard, "Ithaca is Gorges," and it is the waterfall capitol of the East Coast. The concentration of 100+ foot waterfalls in this area in incredible, along with the sheer amount of overall waterfalls. We are fortunate to get the chance to go up to Ithaca frequently and the falls look vastly different on each and every visit. We have compiled our photos of some of the falls within this article, so you will get a tour of these spectacular waterfalls, along with some background information and directions to visit them. These falls are spectacular and worth trips to see in addition to checking out the hundreds of world class wineries, in addition to the world class breweries, academic institutions, and natural attractions that the region has to offer. We will now start off our tour just outside of Ithaca in Taughannock Falls State Park. This gorge is home to multiple amazing waterfalls, including the tallest single plunge waterfall on the East Coast. Upper Taughannock Falls measures in at roughly a hundred feet and has one of the more eccentric drops of any of the falls in the Ithaca area. This vantage point was taken from a former Lehigh Valley Railroad bridge that is now a part of the Black Diamond Trail. Honeymoon trains from NYC to Niagara Falls would stop at these falls en route. This is just upstream from the 215 foot Taughannock Falls, tallest single plunge waterfall on the East Coast. The same view, during some chillier weather. The view of Taughannock Gorge from the other side of the old Lehigh Valley Railroad Bridge. Taughannock Falls measures in 215 feet and is the tallest single plunge waterfall on the East Coast. It is spectacular and has multiple vantage points, including from this roadside overlook. The falls have drawn residents and visitors since the dawn of recorded history. Native Americans lived in the area surrounding the falls, and 19th century industry brought industrial investors, leading to factories utilizing the hydropower offered by the creek, and railroads, steamboats, and associated resorts springing up around the natural beauty offered around the gorge. As mentioned earlier, this was even a stop for people setting off on their honeymoons from New York City, North Jersey, the Lehigh Valley, the Poconos, and Binghamton, on their way to Niagara Falls via the Lehigh Valley Railroad. One visit to this state park you will understand what the draw to this place is about. At the outlet of the creek into Cuyuga Lake, there is a sand beach, swimming area, camping, cabins, and picnic grounds, making this a very well rounded place for recreation. From a period of sustained subzero temperatures. You can hike in to the bottom of the main falls via the Gorge Trail, a 1.4 mile (total) round trip, out and back hike. En route, you will see multiple small falls, including this one. Along with the 215 foot Taughannock Falls. The rock walls of the gorge measure in at up to 400 feet. At this point you feel as if you are in a giant amphitheater. Our next stop takes us to beautiful Ithaca Falls, and Falls Creek Gorge. The falls are estimated to be anywhere from 100-150 feet. The rock formations create spectacular layers in the flow of the water. You are almost certain to catch some fly fishing happening in the waters below the falls. Cornell University sits in the highlands above the falls. Carl Sagan even lived in a house that overlooks these falls. The waterfall was used as a hydropower source for many uses, with Ezra Cornell, the founder of Cornell University, creating a method for using the hydropower for a number of major industries. One of the major companies with Ithaca Gun Company, which called the gorge home for more than a century. Ruins from the old industry remain around the falls. From just after a summer downpour. Look at the rainbow in the mist. On a late autumn day. And on a wintry day! Looking down Falls Creek Gorge towards Ithaca Falls. There are a number of minor falls up through the gorge that would be considered major just about anywhere else. Each measures in anywhere from 15-30 feet. Sidewalks and bridges weave around and across the large Falls Creek Gorge. Toward the top and center of this photo you can see the Suspension Bridge, a popular attraction in the heart of Cornell's campus, which naturally lends itself to being the subject of a good bit of lore and urban legends. You can see quite a few falls all the way up to the dam. This area has also served as a living laboratory for Cornell Engineering students to come up with new methods of harnessing hydropower. These smaller gorge have some nice and little waterfalls in the heart of Cornell University's campus. The path through the Cascadilla Gorge is a great pedestrian thoroughfare between the Collegetown area and downtown. This state park is home to a series of cascading waterfalls with rock formations that create tremendous views as the water flows over them. There is a stone walkway up this gorge that dates back to the days of the CCC. The walkway and trail leads through many waterfalls and cascades up to Lake Treman, a small pond with a spectacular stone dam. The pool at the bottom of the falls is sometimes open for swimming in the summer months. After a week of heavy rains in the summer. This slide waterfall is simply breathtaking, regardless of what time of the year you have the gift of seeing it. Lick Brook Falls at the Sweedler and Thayer Preserves, just outside of Ithaca, is a nice place to explore. Lick Brook is a pleasant gorge that is filled with hemlocks and some smaller waterfalls. The hike is one of the more strenuous in the region, with roughly 500 feet in elevation change in a 1.2 mile round-trip hike. The flow at these falls is light, even during heavily rainy times, but this makes their ice formations pretty neat in the winter. There are three major falls with official measurements of 25 feet, 47 feet, and 93 feet, which look absolutely massive in person. Lick Brook Falls looks absolutely massive. It is listed at 93 feet, but looks to be at least a 100 feet. Visiting Treman State Park makes you feel as if you have entered another world. The rugged beauty of Enfield Glen is something that has drawn people since the dawn of recorded history in the Ithaca area. Ithaca was once the Hollywood of silent movies. We highly recommend the four mile loop hike of Enfield Glen on the Gorge and Rim Trails, a gorge with at least twelve waterfalls, several of which are huge. Treman is a special place to visit and this has been recognized through every period of human history in the region. Native American groups lived in the area, and later settlers built a mill and village in the area. Silent films were filmed in the gorge in the 1910s. During the Great Depression era, the New Deal Program, the CCC, built a bathhouse for the swimming area, lots of infrastructure, bridges, trails, cabins, and more. The area is currently a secluded and popular state park, one of the best that I have ever seen, complete with the ultimate swimming hole. This state park could easily be designated as a National Park. The care that is taken with natural gems like this in New York is something to really marvel at. Looking down into Enfield Glen from the upper area. A series of small waterfalls through the glen lead towards the jewel of the glen, the 115 foot Lucifer Falls. While the Gorge trail is closed in the winter, the Rim Trail is accessible in the winter months to give you a great view of Lucifer Falls. Lower Falls! This place is the ultimate place to cool off. I have never seen a more awesome official swimming hole. There is a great place to lay out, a diving board, lifeguards, and you can even sit on the edge of the bottom of the waterfall. We have made some great summer memories here and we highly recommend checking this place out. While swimming is not possible in the winter months, Lower Falls remains open to visitors. The gorge trail is largely closed for the winter, but Lower Falls is always open. Additionally, the North Country Scenic Trail, which runs from New York to North Dakota, heads through this picturesque state park. Overall, we highly recommend visiting Ithaca, NY. It is within easy range of pretty much all points in Pennsylvania, and the drive up is beautiful as well, putting you within reaching distance of a myriad of beautiful destinations in Pennsylvania.